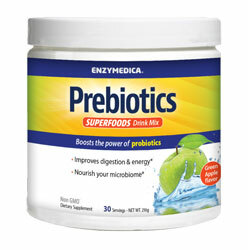 Prebiotics Superfoods Drink Mix, by Enzymedica Inc., is well known for its ability to promote healthy bacterial growth. Prebiotics are most often non-digestible, but fermentable dietary fibers and oligosaccharides. These compounds can act as a fertilizer for the healthy bacteria in the gut. Other Ingredients: Natural green apple flavor, malic acid, Reb A (Stevia Extract), citric acid. Contains NO: gluten, milk, casein, soy, egg, artificial colors or flavors. Suggested use: Mix 1 tablespoon of powder with 8oz of cold water once per day. Enzymedica's Prebiotic drink mix is a next-generation prebiotic formula. It contains incredibly wide-range of diverse prebiotic compounds that supports, promotes, and nourishes microbiome diversity. Enzymedica does not use ingredients produced through biotechnology.